If you are unhappy with the colour of your teeth, we can make them whiter. As time goes by, healthy teeth tend to go darker or yellow and pick up stains from tea, coffee, red wine, smoking or foods rich in colour. 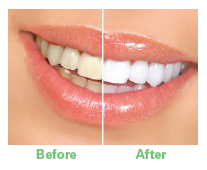 Fortunately, we can reverse these shade changes by tooth whitening. At Rock House Dental Practice we believe that there is only one really reliable way of producing a long lasting whitening of your teeth and that’s by taking a mould of your teeth which is sent to the technician who makes a gum shield which will hold the whitening agent against your teeth. It’s painless, effective and long-lasting.